Having boarded the Shinkansen (of which a lot more later) the next stop on our trip was at Nagano, in the foothills of the Japanese Alps. 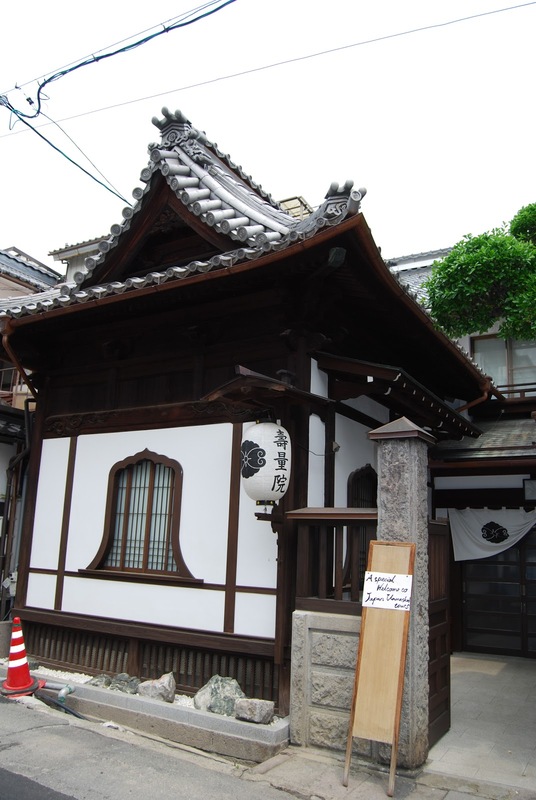 We were staying in traditional lodgings (above) attached to the Zenkoji temple and which were mainly used by visiting monks. Accommodation was in the typical Japanese style with shoji (paper screen) windows, a tokonama (or raised display area, shown behind me) and tatami mats. It's a Japanese custom that whenever a house is entered, there is usually a single step up into it and it's at this point that shoes are discarded and slippers (if provided) must be worn. When we were shown into our room, it had no less that eighteen tatami mats (and was the largest room in the lodgings) and on entering the room, slippers were removed in favour of either bare feet or socks as it's considered impolite to walk on a mat with slippers. The Japanese size their buildings by the number of tatami mats it will accommodate, so if your bedroom is a '4 tatami mat' size, there's not much room to swing a cat, let alone lie down. Conversely if you can boast that your apartment is say, 150 tatami mat size, that's probably a pretty big gaff! After lunch, Tom, our guide suggested that it might be interesting to visit a local sake brewery, for a little bit of imbibing...which we all dutifully did. Sake is a bit of an acquired taste, but it's a taste I soon acquired! ...'delights' of the Japanese breakfast shortly afterwards. As ever, Alyson managed to get her Goshin Chou book signed at the temple by a beaming official.